JOSE MOURINHO WILL not be punished by the Football Association after Manchester United successfully contested a charge he swore in Portuguese during the club’s win over Newcastle. 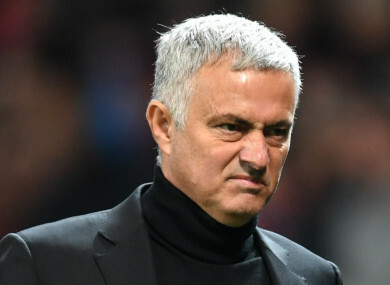 The Old Trafford manager reacted passionately at full-time following his team’s 3-2 home win last month, with TV cameras capturing him gesticulating and shouting as he made his way down the touchline. But United mounted a successful defence, aware the Portuguese faced a possible touchline ban if found guilty. An FA spokesman said: “A charge against Jose Mourinho for allegedly using language which was abusive and/or insulting and/or improper has been found not proven following an Independent Regulatory Commission hearing today [31/10/18]. United, who sit eighth in the Premier League table, face Bournemouth on Saturday (12.30). Email “Jose Mourinho avoids punishment following bad language charge”. Feedback on “Jose Mourinho avoids punishment following bad language charge”.